Over my last few train rides I’ve managed to make some progress in making my app a bit nicer. This makes the inputs (Eingaben) and results (Ergebnisse) pretty self evident. I’m still going to tinker a bit with the view as there is one row that wouldn’t quite fit on one screen and I don’t want the app to start scrolling. I couldn’t quite figure it out how to do that for the simple version where I didn’t have to write a controller for the main app screen. 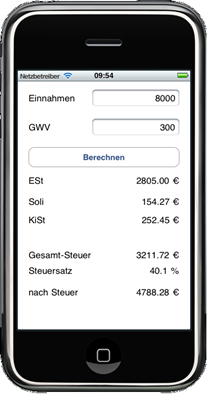 After changing the inputs, the results are automatically calculated. 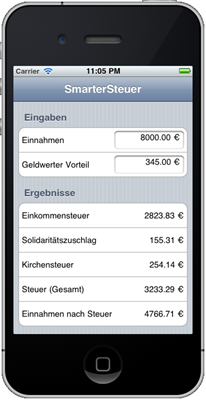 I think that is looking a lot better than V0.1, but there is still a lot to do – both from a design (colors anyone?) and a functionality standpoint, but at least I’m making some progress. I’m hoping to get a bit more done in the “free” days after Christmas, but it already looks like a lot of days are filled with visits to family and friends, and that is certainly important, too. I’ll keep you posted! 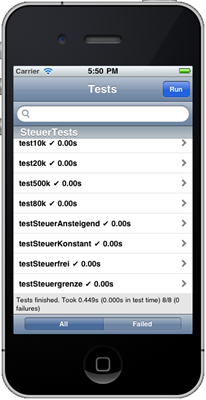 Unit Testing an iPhone App – Not important to Apple? After the base functionality of my iPhone app was in place, I wanted to have a closer look into unit testing. I try to use unit testing where it makes sense when developing for my customers, so I wanted to do that for my own app as well. I was encouraged that there was some documentation in the Apple developer’s guide, and I was really looking forward to putting the framework to use. Before being able to properly test the tax calculation functionality, I had to a bit of restructuring to do in order to properly isolate the functionality I wanted to test and to separate it from the GUI. I pulled the tax calculation into its own class and made the GUI use this TaxCalculator. This separation of concerns is one of the benefits of using a Test Driven Approach – it forces you to think about testability and separation of concerns if you want to have an easily testable class. The changed were totally unnoticeable to the user, but added some value because the code is now much easier to understand and to maintain. It took me less than an hour of development time, and that was time well spent. The next step was reading up on Unit Testing with the iPhone SDK. There is a chapter in the iOS Development Guide that describes how to add tests to your project. From the start, I was getting strange errors even though the tests seemed to pass. As I was developing these tests while riding the train, I played a bit around in order to avoid the problems, but didn’t have any success. I added a few tests for the TaxCalculator, but ran into some more strange behaviour. When I was back home, I googled for my problems and quickly found that it was a problem with SDK 4.1 (thanks to this Stackoverflow question). There seemed to be a workaround in 4.1, but as the problem was fixed in SDK 4.2, I just decided to upgrade my SDK which I wanted to do anyways. After that, I had the next problem – XCode was telling me that my “base SDK was missing”. Googling for that problem I quickly found an easy fix for this issue as well (the one I used was on John Alexander Rowley’s blog, but there is a number of helpful hints across then net. After that, my tests were finally running without any errors and I was finally able to focus on writing test cases. It also enabled me to log to the console and debug my test cases in the XCode debugger just like any normal app – without having to jump through any hoops. You may argue for a nicer interface (color anyone? ), but that is certainly a minor issue. After the disappointing Apple framework, GHUnit delivered on what I was looking for. I’m hoping that the framework will hold up under all the testing I want to throw at it in the next weeks!